If you are a regular bowler, perhaps someone who bowls in a local league and/or in regional competitions, chances are pretty good you already have your very own personalized bowling ball—rather than a rented option—as well as your fair share of bowling gear, such as bowling shoes, resin and other products related to the game. And if you do, you have probably realized that just a standard tote or sports bag is not nearly sufficient to support your ball and gear when you are in transit. For that, you will need a dedicated bowling ball bag, one with enough room and compartments to carry around all of your bowling gear and equipment. That’s where we can help you out. Will You Be Traveling With The Bowling Ball? To assist you in finding just the right bowling ball bag for your needs and particular preferences, below we have reviewed several of the best-selling products in this category, and highlighted some of the pros and cons associated with each product according to users. We have also included a Bowling Ball Bag Buying Guide, in which we will outline and explain the various factors and characteristics you may want to look for when buying one of these very useful products. 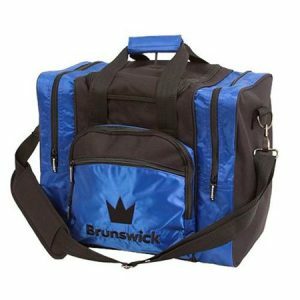 Perfect for the recreational bowler who owns his/her own ball, the Brunswick Edge Single Tote Bowling Bag is a great and very simple carrying option boasting connectable Velcro handles and a detachable shoulder strap with sliding padding for easy lifting and portability. The nylon material from which this bag is made makes it very easy to clean, and the full two-year warranty is a nice bonus. The Brunswick Edge Single Tote Bowling Bag has two large zippered pockets that can hold up to size 15 shoes; and a removable foam ball holder to keep the ball protected when the bag is on the ground. With enough room to carry a wide variety of gear and personal effects, this ball is ideal for the local league bowler that has shunned the unpredictability of rented bowling balls and shoes. Versatile. With connectable handles and a detachable shoulder strap, the Brunswick Edge Single Tote Bowling Bag gives you two ways to carry your ball. Large compartments. In addition to providing ample space for the bowling ball itself, there are two very large zippered compartments. Budget-friendly. The Brunswick Edge Single Tote Bowling Bag is perfect for the budget conscious bowler. Support issues. The bag, according to some reviewers, has a tendency to sag and is not very supportive. Not great with heavier bowling balls. Although perfect for lighter bowling balls, 15 and 16 pound bowling balls are not well supported by this bag. If you own/use two separate balls, perhaps balls of different weights for different types of shots, the KAZE SPORTS 2-Ball Bowling Roller Bag may be the perfect bag for you. Great for travelling, the roller bag boasts two 5-inch polyurethane wheels with bearings for an ultra-smooth ride. The retractable and easy-grip squared off handle sits flush with the bag in the down position and extends to 36 inches to accommodate users of all heights. In addition to the two ball compartments with a foam base for protecting the bowling ball, the KAZE SPORTS 2-Ball Bowling Roller Bag has three convenient accessory compartments for things like resin, towels and personal items, and a vented shoe compartment that can accommodate shoes up to size 15. Perfect for travel. 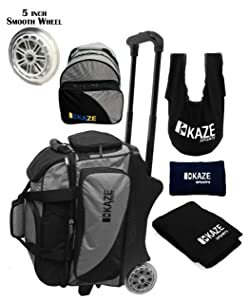 With its smooth rolling wheels and retractable handle, the KAZE SPORTS 2-Ball Bowling Roller Bag is the perfect bowling ball bag for those who plan to travel to out of town tournaments and competitions. Holds two balls. The large bag has room for two bowling balls of any weight. Tough nylon construction. The tough nylon design of the KAZE SPORTS 2-Ball Bowling Roller Bag makes the bag very durable and long-lasting. Problems with zippers. Multiple users have complained about the zippers breaking on the shoe and accessory compartments. Problems with Velcro. A couple of users have pointed out that the KAZE SPORTS 2 Ball Bowling Roller Bag has issues with the Velcro strap that goes around the bowling ball. For a portable, single-tote duffel-style carrying option it’s hard to beat the Pyramid Path Pro Deluxe Bowling Bag. Available in many colors and including an attached name tag to identify your property, the bowling bag features several side pockets for carrying all of your accessories and bowling shoes, and because there are no internal straps to mess with this a great grab-and-go bag when you’re in a hurry. Boasting a 600/480 Dernier nylon construction, the Pyramid Path Pro Deluxe Bowling Bag is very durable. Its many pockets are perfect for carrying items like bowling gloves and positioners; rosin and grip bags; extra socks and bowling tape; and so much more. The shoe compartment can carry shoes up to size 16 (Men’s), as well as notebooks and training aids. Large. The Pyramid Path Pro Deluxe Bowling Bag has ample room for all of your gear and supplies, shoes, accessories and more. Durable. Thanks to its tough Dernier construction, this bag is very durable, and the two-year warranty is very generous and demonstrative of the quality of Pyramid Path bags. Poor Support. 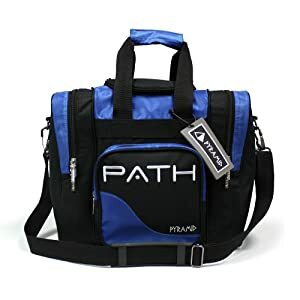 According to some users, the ball support on the Pyramid Path Pro Deluxe Bowling Bag is poor, limited to a single piece of foam that gives with heavier balls. Strap quality is questionable. Several bowlers have reported broken straps with the Pyramid Path Pro Deluxe Bowling Bag after only a couple of uses. When it is time to shop for a new bowling bag, there are several things you should look for to ensure you get the best quality bag for the money, one with the construction and features you need and prefer in a bag. To help you with this, below we have outlined several of the factors you should consider when shopping, and some of the characteristics you should look for in your new bowling ball bag. If you are like most recreational bowlers, you will probably be looking for a single tote bag designed to carry but one bowling ball at a time. However, if you are a serious or even a professional bowler, you may own two or three different balls for different lane types and shots. Bowling ball bags come in different sizes, with some able to carry as many as five or six bowling balls at a time. Just like many of the higher end luggage today, with wheels that make it easy and comfortable to walk through the airport and to your car, bowling ball bags are available in tote and wheeled designs. If you are carrying a single ball with just a few pieces of equipment, chances are you can get away with a tote bowling ball bag, which is also very portable, compact and easy to store. 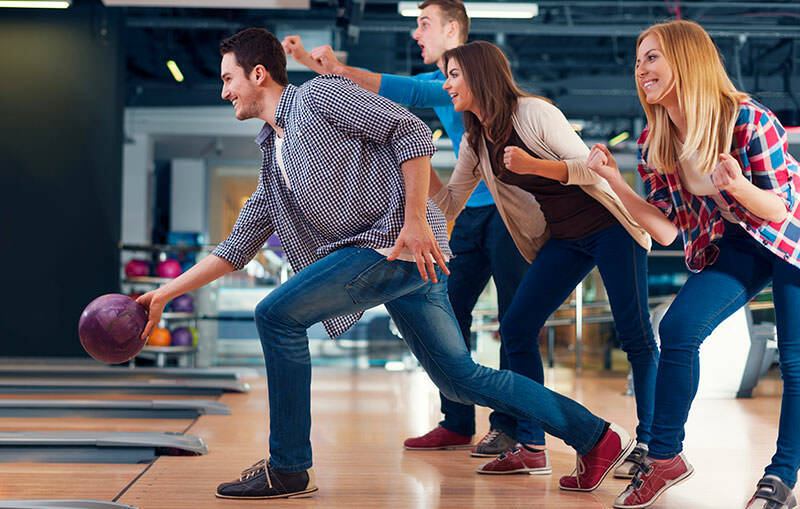 However, if you plan to carry multiple balls or a great amount of bowling equipment, you may want to elect for a bowling ball bag with wheels, which protects your ball while saving your arm and shoulder strength for the game. Bowling ball bags can be very small, simple and compact, or roomy and extremely elaborate, with multiple compartments to carry items like golf shoes, towels, resin and everyday items like your keys, phone and wallet. Therefore, before you set out to purchase one of these bags, think about the amount of space you will need—both now and in the future. This will help determine the best bag for your particular needs. Like with golf club bags, some bowling ball bags are better suited for air or rail travel. Hence, if you currently—or plan to—play in a lot of out-of-town tournaments and competitions, look for a bag that can be easily transported without adding a lot of extra weight and hassle. Leather. Although you might think leather would make for a durable bowling ball bag, it is actually the least durable material you can buy. Leather cannot handle the continual stress of travel back and forth from the lanes, but if you are merely an occasional bowler who wants to look trendy, leather may be right for you. Polyvinyl. Polyvinyl is “made with plastic thread that has been tightly woven together to create a semi-stiff cloth that is waterproof and very closely bound.” It is the second-strongest material used to make bowling ball bags. Nylon. A man-made material, nylon is the most durable material from which bowling ball bags are made. Nylon bags are also often treated during the final finishing process to be water repellent or water resistant. You will want to make sure the zippers and straps on your new bowling ball bag can stand up to the wear and tear—and more expensive bags are not always better than those that are budget friendly. Be sure to read plenty of reviews before purchasing your next bag to sniff out any pattern of complaints about the zippers and straps. Like some luggage, some bowling ball bags are equipped with at least one lockable compartment—usually the compartment in which you will place your bag. Others have compartments in which you can lock up personal effects like wallets, money clips, keys, phones, etc. Again, be sure to read plenty of reviews to determine the quality of these locks. When purchasing your next bowling ball bag, be sure to read through this helpful checklist. Doing so might help you avoid purchasing a bag that isn’t quite up to snuff, and may instead assist you in finding the perfect bowling ball bag that meets all of your specific needs and personal preferences.